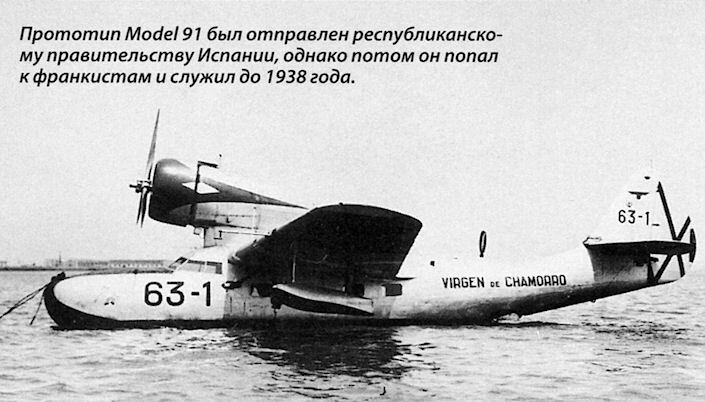 Компания "Pan American Airways" заказала фирме "Fairchild" летающую лодку-амфибию, пригодную для коммерческих полетов в Южной Америке и Китае (особенно в бассейнах рек Амазонка и Янцзы). В 1934 году началось проектирование амфибии Model 91. Вскоре "Pan American" ДальшеMore>>> сняла китайский заказ, поэтому Model 91 оптимизировали для службы на Амазонке. В итоге появилась прочная и надежная машина Model 91. Первая такая лодка впервые взлетела 5 апреля 1935 года под обозначением Model A-942-A. Это был свободнонесущий высокоплан с установленными на стойках под каждой консолью вспомогательными поплавками, двухреданным металлическим корпусом и убирающимся шасси с хвостовой опорой. Компания "Pan American" заказала шесть амфибий Model A-942-A со звездообразными моторами Hornet мощностью 800 л.с. (597 кВт), установленными в гондолах над фюзеляжем, и тянущими винтами. Однако после поставки двух лодок авиакомпания отменила свой заказ. Из оставшихся в стадии строительства четырех планеров один достроили в виде модификации Model A-942-A.Три остальных сделали в версии Model A-942-B с моторами Wright GR-1820-F52 Cyclone мощностью 875 л. с. (652 кВт). Два самолета, приобретенные "Pan Am", прекрасно летали над Бразилией в качестве летающих лодок со снятым для увеличения полезной нагрузки колесным шасси. Из-за их большого потенциала остальные четыре машины оказались лишними. Две из них продали частным покупателям (позже одна служила в британских ВВС в Египте), еще две ушли в Японию. SIX Fairchild amphibians of a completely new type are soon to be placed in service by Pan American Airways on its route along the Amazon River from Para to Manaos, and in other sections of its system where the adaptability of the amphibian type is desirable. These machines were designed to meet Pan American's specification for a high-speed amphibian using a 650 h.p. engine, with a capacity of eight passengers, two pilots, and 1,000 lb. of mail and/or express goods, and a cruising range of 750 miles. The cruising speed of the new machines is 158 m.p.h. at 3,000 ft. and the maximum 184 m.p.h. The hull is of the semi-monocoque type, embodying five water-tight bulkheads, and a number of frames of flat sheet formed into Z-sections These frames are pierced out near the skin to allow the stringers to pass through between the water-tight bulkheads. Duralumin sheet is used for the side stringers, which are of Z-section, but the bottom stringers of the water planing surfaces are duralumin extrusions. A keel former rather than a heavy keelson is employed, the water loads being carried by the frames and bulkheads into the side skin. The chine spray strips, which are of duralumin extrusions, are actually structural members of the hull. Riveted to the hull is the centre section of the cantilever wing. It is of two-spar construction, and carries two fuel tanks of 180 gallons total capacity .between the spars. The outboard panels are detachable, and also embody two spars, with thin sheet webs and flanges of duralumin extrusions. The top covering of the wing is in two layers, the inner one with corrugations running parallel to the spars, and the outer one of flat sheet riveted to these corrugations. By utilising the lower flange of the front spar as a rail for the undercarriage retracting trolley, a great deal of weight has been saved. The rear spar of the centre section does not run straight through the hull, but curves above it. Metal covering is used for the leading edge of the wing, but the trailing edge is fabric-covered. Metal-framed ailerons are used, statically and mass-balanced by lead weights carried on arms projecting forward from the hinge line and enclosed in the wing at all except large “up" aileron angles. The trailing-edge flaps are attached by slide fittings at their leading edges, and links close to their trailing edges. They are actuated by cables which are wound round a grooved drum in the hull and attached to the flap slide fittings, which move fore and aft on slide tracks upon the rear spar. All surfaces of the empennage have duralumin frameworks and fabric covering, with the exception of their nose pieces, which are covered with duralumin sheet beneath the fabric. Both fin and tailplane are braced to the hull by streamlined tie rods, and all control surfaces embody trimming "tabs." The undercarriage and tail wheel retract simultaneously, the landing gear structure being so designed that the wheels fold rearwards and upwards, rotating slightly around the axis of the shock absorbers, so that they lie flush with the undersurface of the wing when retracted. A spindle installed within the front spar flange operates a trunnion on the wheel trolley. When turned, this spindle causes the trolley to move inboard or outboard. The tail wheel retracts into a well on the underside of the hull aft of the second "step." By means of a parallelogram arrangement of struts the wing floats retract against the underside of the wing. A spindle and trunnion mechanism is used. A recess is provided between the spars, so that the float bracing struts are fully concealed within the wing, and a metal panel, attached to the outer struts, hides the entire float mechanism when the floats are retracted. Only one hand crank, one motor and a gear box are used to divert the driving power to the landing gear, flaps or floats, one at a time, when required. An electrical system, with hand cranks for emergency use, is employed. Welded chrome molybdenum steel tubing is used for the nacelle structure, which is carried above the wing. It is attached fo the centre section at three points - at the rear spar, and at two points on the front spar. The engine – a Pratt and Whitney "Hornet S4D1," giving 650 h.p. at 2,050 r.p.m. at 3,000 ft. - is supported by means of rubber bushings which allow it to move slightly in the direction of torque, but not in the fore and alt direction. An N.A.C.A. cowling is used. The rear portion of the nacelle can be used for storing baggage or equipment, while its forward portion houses the oil tank, oil cooler, engine controls and accessories. The first compartment of the hull, in the extreme bow, is employed for the storage of the anchor and other marine equipment. Aft of this is another compartment utilised for the stowage of baggage, mail and cargo, and accessible from the deck through a hatch. A water-tight door leads to the pilots' cockpit which is immediately behind, and is fitted with dual controls. The engine controls and electrical switches are attached to the roof, and the selecting lever, switch and hand crank for the retracting mechanism gear box are installed between and above the two seats. Dimensions Span, 56 ft.; length, 46 ft.; wing area, 485 sq ft. Weights. - Weight empty, 5,500 lb. ; gross weight. 9,600 lb. Loadings. - Wing loading, 19,78 lb./sq. ft.; power loading, 14.76 lb./h.p. Performance. - Maximum speed (sea level), 171) m.p.h. ; maximum speed (at 3,000 ft.), 184 m.p.h. ; cruising speed (85 per cent, power), 158 m.p.h. ; absolute ceiling, 20,000 ft.; stalling speed (without flaps), 68 m.p.h. ; stalling speed (with flaps), 58 m.p.h. ; range at cruising speed, 750 miles; take-off time (land) 16 sec. ; take-off time (water), 36 sec. FOR SERVICE IN SOUTH AMERICA: The first of six new high-speed amphibians which are to be used along the Amazon River from Para to Manaos and in other sections of the Pan American Airways system. The photograph of the Fairchild 91 PP-PAP in service with Panair do Brasil. The example acquired by the RAF may in fact have been c/n 9405, purchased from Gar Wood. PAN AMERICAN DEBUTANTE. 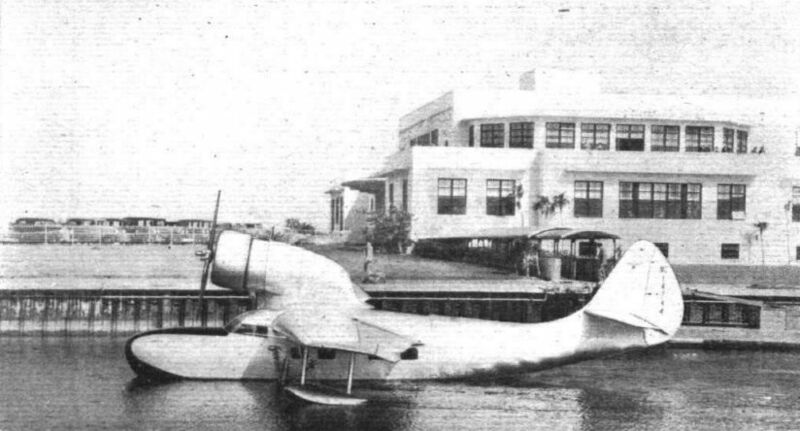 American modernity is the keynote of this view of the first Fairchild Baby Clipper (P. & W. Hornet) moored after its delivery flight to Pan American Airways at the International Airport, Miami. This particular machine will be used between Para and Manaos down the Amazon River. 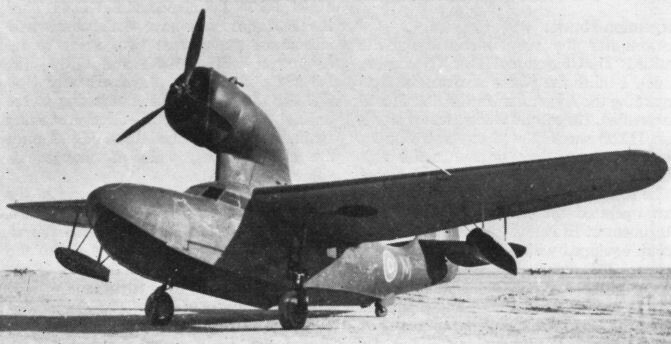 The sole Fairchild 91 acquired by the Spanish Nationalist forces in March 1937 following the interception of the Spanish Republican Mar Cantabrico. Прототип Model 91 был отправлен республиканскому правительству Испании, однако потом он попал к франкистам и служил до 1938 года. R.A.F. 's MYSTERY CLIPPER. Better known by its P.A.A. (China) name of F-91 Baby Clipper, the Fairchild XA-942A of 1934 was an all-metal eight-seat amphibian powered by either a Wright Cyclone or (in this case) an 800-h.p. P. & W . Hornet S3E-G radial. Hal G. Martin, who took this unique photo, has been able to fill in some of the missing detail of the R.A.F. 's sole XA-942A. Painted green and white, ex-NC15952 was purchased by the British American Ambulance Corps. and named "Wings of Mercy" - and was originally intended for Channel Spitfire rescues. Max. speed 215 m.p.h., cruise 167 m.p.h . ; a.u.w. 9.700 lb. ; span 56 ft.; length 47 ft . P.A.A. never took delivery of the (3rd) Baby Clipper. The Fairchild 91 amphibian evaluated by the Japanese Imperial Navy as the Type А Amphibious Transport. The Fairchild 91 HK832 photographed in North Africa with the "Baby Clipper" symbol faintly visible on the nose. Points of interest to be seen in this elevation of the Fairchild Baby Clipper include the anchors and drogues in the bow compartment, airscrew guard over the forward hatch, accommodation for passengers and crew, retracting tail wheel and the general compactness of the whole layout. The engine is a 750 h.p. nine-cylinder Hornet radial.